I've been using my old account for over 10 years, but it's a Battletracker account. Assist tells me the account doesn't exist when I try to log in. I can log in on Battletracker, and on the Assist client using that account, but can't log into the website. So I worry that once Battletracker is taken down, the old account will be taken down. I made this account a few days ago and have been told activation has been declined (understandably). Could I please ask that an admin pm me to either migrate the honor/stats off my old account onto this one (and activate this account), or somehow import my old Battletracker account into Assist so I don't lose it? What is your old login or player name? Your account with 36 honor with the login name of Brizzler is definitely in our database. What is the error you're getting trying to login? Sorry for the delay. It just says the account doesn't exist when logging in on the website (as below). Does it log you in into Assist? 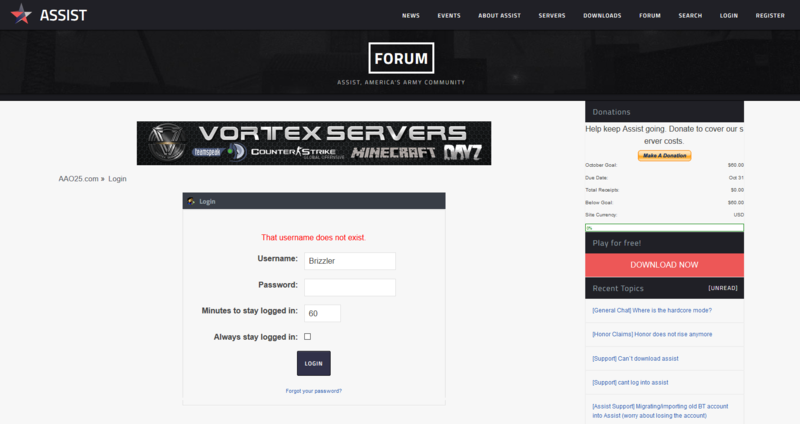 .. the forum login is definitely separate from your game account. Ah ok, but in that case, where will the game account be kept? Will the old account get deleted when BT goes down and I'll just need to make a new one elsewhere when that happens? Also, on BT it says my honor is 40, but in-game it's been 36 for about a year now with relatively regular play. It really looks like something isn't linking up properly but I'm not sure what it is. Yes. Once we changed our system to use our own database and not Battletracker, honor will no longer increase. Help keep Assist going. Donate to cover our server costs. Straring up Thursday night rotation in the Barnyard! All are welcome and if you have clan beef come kill each other, ;). Lets keep the tradition going. LOL WE GOT A SARGE HERE!!!! it says I have punkbuster restriction and it says "NoHeartbeats"
@Fun, that is the 285 non installer from 3 gb? where is that for? how about deleting it all together and install 2.8.5 from scratch? i have the patch, unzipped it and extract but keep starting up 2.8.4. Anyone have some tips? I cant update 2.8.4 to 2.8.5 ? come on guys !!!!!!!!!!!! i dont want to netflix with my wife lol..
lol thanks playtronics, playing it since 2004.. If you need anything let me know. oh wow now they they nerf the Carriers, after I deleted the game lol, thanks for the info,yeah I might pick up that server for some other hobby I was thinking I might play with setting up AA server, I have many server but they were always managed server from hosting companies, this would be the first attempt at actually runing one, just for fool around really. Cya arround. Thanks CPD, Do you know if it will run on the Linux Ubuntu 16.04 LTS OS? On another note you still playing World of Warships? 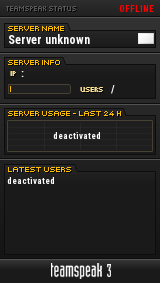 AA servers dont require much. 255mb ram at most and any old centrino can run no problem. The connection on the other hand is just okay. Tech question for all you AA admin gurus, does anyone know if you can run AA server on the following specs? Dell PowerEdge Server R710 2x Xeon E5620 Processors, 2.4GHz, Quad Core (total 16 threads) 48GB RAM, Connection 300mbps down, 30mbps up, on the 64-bit Linux Ubuntu 16.04 LTS OS? Hi Vieux, yes the game is still being played, peak time depends on the time zones of course see the base community of players is rather small. AA is still played? or a new version? Please Login To Use Shoutbox.